There is no so-called "death star" lurking at the outer reaches of the solar system, flinging dangerous comets at Earth on a periodic basis, a new study finds. Some scientists have invoked the existence of such a star, also known as Nemesis, to explain a perceived periodicity in mass extinctions on Earth. As Nemesis cruises through space, the theory goes, it regularly disturbs comets in the faraway Oort Cloud, sending large numbers of the icy wanderers on a collision course with Earth. "There is a tendency for people to find patterns in nature that do not exist," said study author Coryn Bailer-Jones, of the Max Planck Institute for Astronomy in Heidelberg, Germany, in a statement. "Unfortunately, in certain situations traditional statistics plays to that particular weakness." Earth has, of course, been hammered by asteroids and comets throughout its 4.5-billion-year history. 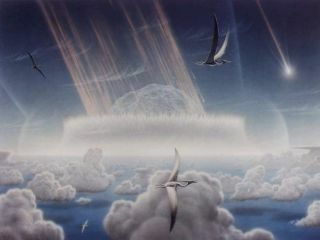 One such giant impact is thought to have wiped out the dinosaurs 65 million years ago. The idea of Nemesis sprang from studying such mass extinctions. Back in the 1980s, scientists reported a periodicity in these catastrophic events, saying they appear to have occurred every 26 million years or so over the last 250 million years. Some studies of Earth's craters have supported the Nemesis idea, finding evidence of periodic variations in the impact rate. Every so often — the numbers vary between 13 million and 50 million years — the impact rate seems to go up substantially. The new study, however, contradicts those claims, finding that Nemesis — like the rogue planet Nibiru that some conspiracy theorists say will destroy Earth next year — is probably a myth. Bailer-Jones used Bayesian analysis — a different kind of statistical technique — and found no such pattern. Rather, his results show a different trend: From about 250 million years ago to the present, the impact rate, as judged by the number of craters of different ages, increases steadily. This view of comet Halley's nucleus was obtained by the Halley Multicolour Camera (HMC) on board the Giotto spacecraft, as it passed within 600 km of the comet nucleus on March 13, 1986. There are two possible explanations for this apparent increase, according to the study, which was published online in June in the journal Monthly Notices of the Royal Astronomical Society. On the one hand, smaller craters erode more easily, and older craters have had more time to erode away. So the trend could simply reflect the fact that larger, younger craters are easier to find than smaller, older ones. "If we look only at craters larger than 35 kilometers (22 miles) and younger than 400 million years, which are less affected by erosion and infilling, we find no such trend," Bailer-Jones said. On the other hand, the increasing impact rate could be real. For example, analyses of impact craters on the moon— where there are no geological processes that can cover up or fill in craters — show the same pattern. Whatever is causing the apparent increase in impacts, the new study casts doubt on the existence of Nemesis. "From the crater record, there is no evidence for Nemesis," Bailer-Jones said. "What remains is the intriguing question of whether or not impacts have become ever more frequent over the past 250 million years." It's still possible that the sun could have an undiscovered large companion lurking far away, perhaps a red dwarf star or an odd failed star known as a brown dwarf. But it's not likely that such a companion has wreaked havoc on Earth, according to the study.